The Gigaset DX800A has been specially designed for small businesses and home offices. 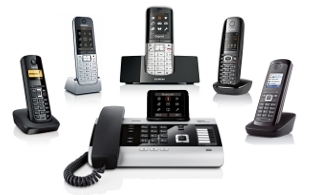 This professional multi-line desk handset can connect to VoIP, ISDN and/or the public switched telephone network. It can be expanded to accommodate six DECT devices, and is characterised by the high level of user friendliness and recognisable user interface that you have come to expect from Gigaset. With the Gigaset DX800A, you and your employees can conduct four calls simultaneously and at any one moment, with superior high-definition sound quality. Furthermore, the link2mobile function allows you to integrate your mobile phone into the network and to answer calls from both land lines and mobile phones. This enables optimum flexibility and maximum convenience. Furthermore, the phone has a fax port and three integrated answering machines. This is extremely useful if you wish to set different voice mail messages for business and personal callers.